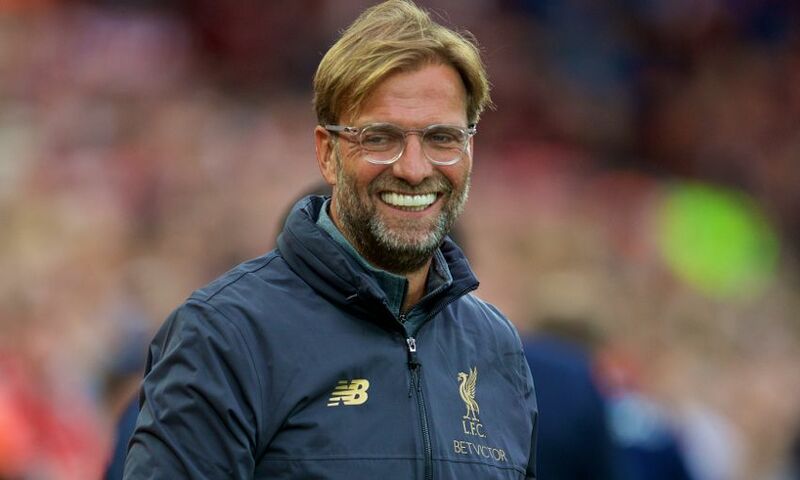 Jürgen Klopp is delighted that the season is now in sight after Liverpool beat Torino 3-1 at Anfield in their final warm-up before the Premier League begins. Goals from Roberto Firmino, Georginio Wijnaldum and Daniel Sturridge earned the Reds a fourth successive win before they kick off the campaign at home to West Ham United on Sunday. A range of fan activities were held before, during and after the first pre-season friendly held at the stadium since 2014, too, as excitement and optimism reaches a crescendo. We will see. We will see what happens. I don’t know. I’m happy about the game tonight and about what we did, the whole atmosphere. But I have no idea what will happen in the next two days. It’s all open, what can I say? You have to wait. I don’t update each second. It was nice that Ingsy could play tonight, he has been fit for two or three weeks, it’s no problem but we didn’t want to go with any risk. A few things happened in the past but for a long time he has been fit. He was unlucky in a situation in the last game, now you saw tonight one situation with one touch to bring it into the right position and still finishing – a typically Ingsy situation. I’m really happy for him. The atmosphere was nice around the stadium. The phrase I heard most often tonight was: ‘It was his first game at Anfield.’ A proud dad said it to me about his boy. That’s really nice. [There were] a lot of kids around. It was just good. And my boys delivered a good performance and an exciting game, good football, so it was all round a good Liverpool night. The players from last year are responsible for the excitement, and then we brought in a few new players as an icing on the cake. That’s cool. I’m happy that we came through the pre-season so far, so good. You saw tonight we don’t really struggle with centre-halves, they are all in and only have little things. But for tonight, the two available played. Nat Phillips played an outstanding pre-season and now he played the game tonight, 70-80 minutes at Anfield for the first team. It is really nice to see how he developed. These two are fit, good. 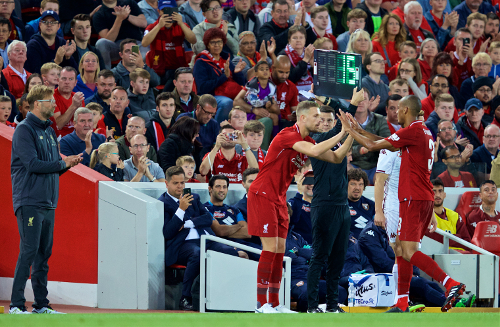 Marko [Grujic] played it, Fabinho played it, so all OK. That’s the situation in the moment. Adam Lallana, good game, came back. All good news. The guys from the first half, I didn’t hear anything about any issues so they came through 45 minutes again, good. Now we have to make the last step, we have to bring ourselves into the competition, in a championship mood, really being 100 per cent focused in all the situations. Obviously in the offensive department we are able to do some nice things but that’s only one part of the game. We have a few days, I like that. But I’m happy we can start at the weekend because pre-season is good but the season is even better. [I’m] not sure, don’t know – we have to see how he reacts. But it is Hendo, so to be honest in the first session it looked like he trained for the whole three weeks. He was in a really good shape, so we thought a few minutes tonight should be possible. He’s experienced enough not to bring himself in difficult situations where he has to run two or three miles in two minutes. He can control the game and that’s good, really good, and for us he is a very important option of course. I have no clue in the moment what we will do at the weekend. It is always this kind of mix – Hendo of course needs a kind of pre-season, but not as much as the others because he was not as long off. We have to think about it; after the West Ham game we have eight days. It is Sunday to Monday and we play Crystal Palace on Monday, so it is good – good for us because it is one day more in the week which we can use. We will see, but hopefully they are all fit and I have a few difficult decisions to make. It helps everybody. I haven’t spoken to him because I was immediately in the signing session, if you want. I was not surprised, to be honest, but as a human being I was hoping for it, that it would be like this. I loved it, to be honest. Is it possible being different in a really hard world? Yes, I think it is possible. We showed tonight a really nice face and I liked it. It helps not only Loris, it helps Alisson as well, that you can see this is a very special place. It was a really big gesture. I think yes. It was nothing serious but for tonight it was not possible. He played on Saturday and now it’s Tuesday, but he should be [fine]. Dejan [Lovren] is in, he had not a very long holiday. For Raggy [Klavan] and Joel [Matip], probably they are not fit and cannot play for the weekend, but we don’t need 12 centre-halves, we only need two at least and one to change would be extremely cool. Nat is there, though. I really liked his pre-season, it was really strong and proved a lot and that was cool.